The swine flu – officially called the H1N1 virus – reached two more basketball players in Greece as Euroleague side Maroussi will be without Michalis Pelekanos and Kostas Kaimakoglou with the illness. Also in the news, Spanish star Pau Gasol returns for another test in acting and Euroleague to offer viewers first hand access. Pelekanos and Kaimakoglou did not accompany the team to Slovenia for their Euroleague game at Union Olimpija. sport-fm.gr also said that Maroussi asked unsuccessfully for the Euroleague game to be postponed. The club – which is also dealing with injuries to guard Georgios Diamantopoulos and center Stephan Arigbabu – also has asked the Greek league to postpone their domestic league game against Olympiacos on Sunday. It looks like Spain’s Los Angeles Laker center Pau Gasol is having fun out in Hollywood. The recently-crowned EuroBasket 2009 MVP will be making his second appearance on U.S. television. 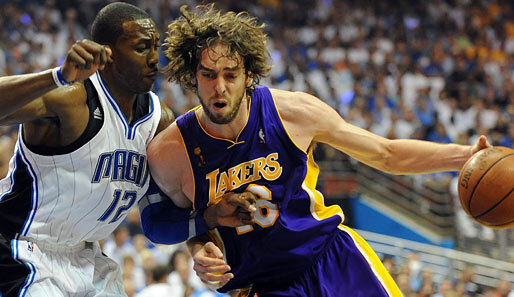 Gasol will be appearing on the CBS crime series “CSI:Miami” on November 16 according to AOL television. Gasol’s character will be someone the investigative team wants to talk to in relation to a terrible car accident. During the case, dark secrets are revealed about both drivers, but CBS is not spilling on whether or not Gasol was one of the drivers. We were hoping he’d be a victim so we could see what pun David Caruso would say over his dead body. Gasol has already tried his hand at action, making an appearance on an episode of “Numb3rs” with teammate Jordan Farmar. Here is a fun announcement and good idea by Euroleague Basketball, who will equip the referees with microphones for TV for Thursday’s game between Regal FC Barcelona and Cibana Zagreb. Euroleague Basketball has announced that, for the first time in a Euroleague regular season game, the referees will wear microphones for TV on Thursday’s clash between Regal FC Barcelona and Cibona Zagreb in Group A. The game will be shown live by local host broadcaster TV3, which serves the Catalonia region of Spain. TV3 plans to continue offering its viewers selected sound bites of live comments by Euroleague referees throughout the season. Euroleague referees have already previously worn microphones and had both their live and recorded comments available for broadcasters at the last two editions of the Final Four, in 2008 in Madrid and in 2009 in Berlin. is swine flu even bad anymore??? is there a vaccine? ?